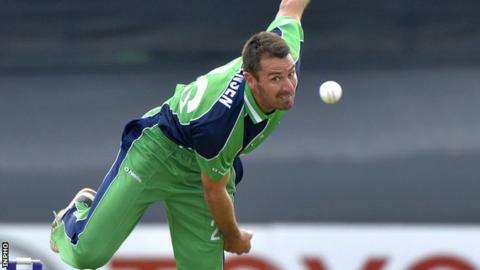 Ireland moved 2-0 ahead in the three-game T20 series against Papua New Guinea thanks to a seven-run win in a rain-affected encounter in Australia. Frequent showers reduced the game to 11 overs a side and Ireland posted 96-5 with crucial knocks from Stuart Poynter (35) and William Porterfield (30). George Dockrell and Max Sorensen each took three wickets as PNG fell short of their target on 89-9 in Townsville. The final game in the series takes place in Townsville on Tuesday. Ireland eased to a five-wicket victory in Saturday's opener but it was a much closer affair 24 hours later. Ireland overcame the first-ball dismissal of Andrew Balbirnie with Porterfield and Poynter, scoring a flurry of boundaries in the opening powerplay. Porterfield, in his 100th game as captain, scored 30 off just 15 balls while Poynter cleared the ropes twice in his 35 from 24 balls. However, the Irish added just 26 runs in the last four overs as Papua New Guinea debutant Pipi Raho claimed 3-11. Asad Vala (25) gave the Pacific Islanders a rapid start, but his dismissal saw the hosts implode. They lost seven wickets for just 22 runs with Dockrell (3-18), Sorensen (3-24), and Andy McBrine (2-7) doing the damage. A late flourish from Norman Vanua, with two sixes in an undefeated 26, came too late as Ireland held on to clinch an unassailable lead in the series. "It's great to be 2-0 up in the series with two solid performances," said Porterfield. "To be asked to bat first in potentially tricky conditions with the rain around I thought the lads did really well. "The bowlers then, as they have done all trip, backed that up with another great display to win the game."